Betway.com is one of the well-known European online sport betting websites. 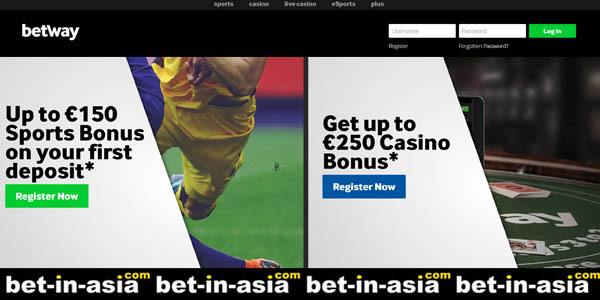 Betway has expanded their target from Europe to Asia thanks to their special promotions and reliable services. – International licensed based in Malta. – Promotion: Free sports bet up to $ 30. – Official sponsor football clubs: RSC Anderlecht, West Ham United. There is no limit sports on Betway Sportsbook. Player can bet on football, Basketball, hockey, tennis, horse racing, boxing and a lot more. Apart from Sports book, Betway also has various choices game such as Casino, live Casino, and e-sports. All of the games have special promotions. The major Payment methods of Betway are Visa/Master Card, Local Bank Transfer, Skrill and Neteller. In some countries, Bank wire is not the option. If you want to find an easy and fastest way to deposit and withdraw from Betway or any sports bet websites, register an account with Skrill.com or Neteller.com. One of the convenient way is to use your mobile and tablet for betting. You can even claim bonus when you first use mobile to bet. Before you can use mobile app, you need to register website betway.com first to be able to download and access of the Application mobile and tablet.